Ross Fredrik Tipton, 102, of Columbus died May 20, 2013 at Hospice of the Carolina Foothills. He was born Aug. 5, 1910, in Brazil, Indiana, the oldest of six children of Fred and Cora Tipton. He was a lifelong musician, playing trumpet from a young age. He graduated from Indiana State University, and received his Master's degree from Purdue University in mathematics, chemistry, physics and music. He married Helen Lucille Hendricks of Oxford, Indiana in 1937, four months after meeting her on a blind date. They were devoted to each other and to their family, and happily celebrated 75 years of marriage together in September of 2012. Ross was a professional educator, and worked as a teacher of math, science, and music, and was a basketball coach for many years. 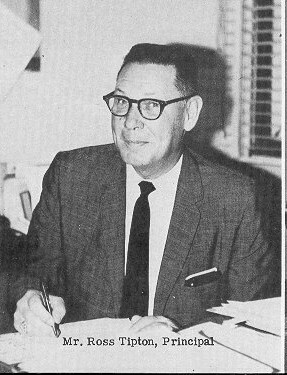 He became a school Principal, then Superintendent, working in the towns of Oxford, Linden, Delphi and Auburn, Indiana. During this time, he enlisted in the US Navy, serving as a Lieutenant JG radio officer on the USS Fergus in World War II. He crossed the Pacific five times on the Fergus, and was in Okinawa three times. Although he was exempt from the draft due to family and career obligations, Ross felt that he had to enlist in order to protect his family, and served honorably for several years. After the war, Ross worked for the Department of Defense, supervising schools for the children of American servicemen abroad. He and Helen lived and worked in Turkey, Holland, France, and Germany. Part of his legacy will be the thousands of people he taught, coached, or conducted, many of whom continue to remember him even decades later. He regularly received letters from former students, particularly the alumni of the school in Dreux, France. After returning to the United States, Ross worked as the assistant superintendent of schools at Camp Lejeune in Jacksonville, North Carolina, until he retired. He and Helen lived for many years in Maitland, Florida, where his passion for golf truly flowered. Rarely a day went by without Ross playing a few rounds or practicing his putting. One of his proudest moments was hitting a hole in one at Winter Park Golf Course; the trophy still sits on his shelf. In addition to golf, Ross loved dogs and liked to hunt, and he also liked cats. In 2008, Ross and Helen moved to Polk County, North Carolina to be closer to family. He is survived by his wife, Helen, and his daughter, Mary Catherine Holcomb of Tryon. He was predeceased by his son, Thomas, of Tryon in 2011. In addition, he is survived by his grandson, Erik Holcomb of Tryon, his grandson, Brian Holcomb of East Lansing, Michigan, and his granddaughter, Christina Hammock and her husband Damion Hammock of Orlando, Florida, and Ross’s great-grandchildren Gregory, Jordan, and Julia Hammock. He was dearly loved by his family, and will be greatly missed. A memorial service is planned for 1:00 on Thursday, May 23 at LaurelHurst in Columbus. Everyone is welcome. The family wishes to express its gratitude to Hospice of the Carolina Foothills and its employees and volunteers, especially Dr. Kennerly, Joanie, Trish, Walker Williams, Mike Clark, and special friend Bill Cline. They have all been a blessing to us. Memorials may be made to Hospice of the Carolina Foothills, 260 Fairwinds Road, Landrum, SC 29356. www.hofc.org.